Description: "When you steal a girl, your beloved one is also stolen by other man." junior student and female teacher with their overflowing sexual desire. Will you defend your beloved one?.... Or like other guys do... Mate with other girls!? Addition of contents is planned for this product. Touching scenes, H scenes and even pose art in daily part are completely animated! Mainly in the school building, it is all you can f*ck anywhere in the map! Renovated cross-sectional view function gives you even more realistic feelings! Plus a new function "captions" directly transmit pleasure to you! 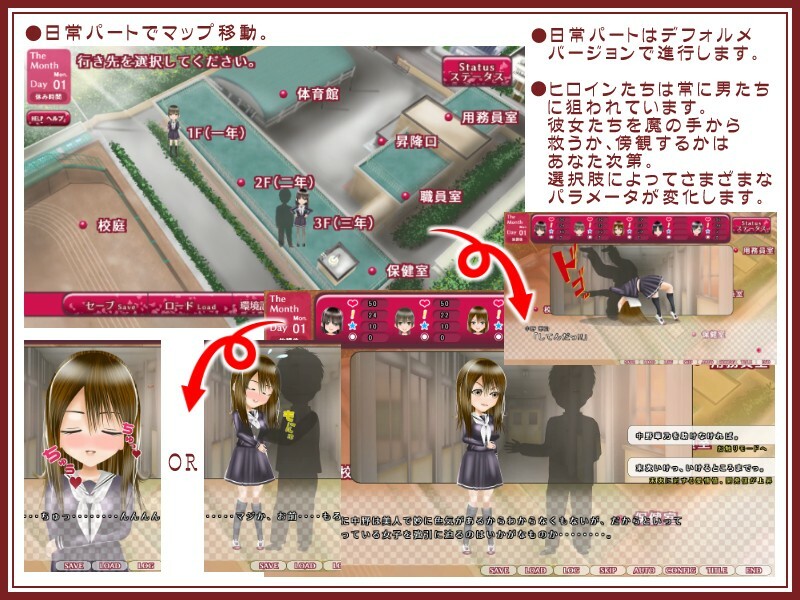 SD characters move around in the daily part, where you can perform sexual mischief! Irvina, a girl who came to the country of adventurers "El Grande" for the settlement of one case. It seems that the female trader who came to the country of "Kaona" was interested in sold fashionable clothes, which she bought. But the clothes she bought for the royal court of El Grande were stolen!